David Shantz Sent to Elmira Jackals of the ECHL · Let's Go Amerks! With the excellent play of newcomer Mike Brodeur it was only a matter of time before David Shantz was going to be reassigned to another team. Rochester Americans General Manager Jody Gage announced today that the Florida Panthers have reassigned goaltender David Shantz to the Elmira Jackals of the ECHL. Shantz had been called up to the Amerks on November 10th and at the same time Tyler Plante was shipped off to the Dayton Bombers. The Bombers and Jackals face off on January 13th and 14th in Elmira if you’re interested in seeing either goaltender possibly play in the area, we’ll be heading down to check the game out. Shantz departs Rochester after posting a 0-3-1 record with a 2.94 goals-against average and a .898 save percentage in five games between the pipes for the Amerks. The 22-year-old native of Burlington, Ontario, began the 2008-09 season with the Dayton Bombers (ECHL), where he registered a 4-2-1 record with one shutout to go along with a 2.35 goals-against average and a season-high 160 saves in seven games. 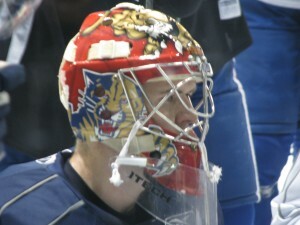 The 6-foot-1, 207-pound netminder was the Florida Panthers’ second-round selection (37th overall) in the 2004 National Hockey League Entry Draft.